The Tea Box: It's a Snap! "It's a Snap! 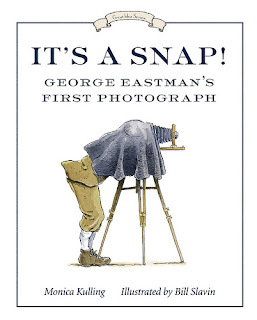 : George Eastman's First Photograph" by Monica Kulling, illustrations by Bill Slavin, Pub. Tundra Books, Toronto, August 2009. In this book, greatly illustrated by B. Slavin with watercolour pictures of various formats and perspectives, the author tells the story of how Eastman was able to invent, over 100 years ago, the prototype of modern photographic machines. the second factor is the historical and, indirectly, sociological one. Having kids approach photography from the pre-Digital era, and pre-Reflex as well, is not a mere scientific exercise but it allows to compose a much wider fresco including past and present customs, allowing highlights on their differences and likeliness. Who never posed for a group picture? But in the past, posing required quite some time. Nowadays we take pictures in every occasion, to remember precious moments, how about 100 years ago? When did they use to take pictures? Monica Kulling's simple and solid writing, with the right pinch of irony and practical information, is the perfect way to get to understand the complex world of photography, and Eastman's intriguing life's course. Illustrations, at times whole page ones, others little fragments framing particular moments, some in colour, some in sepia tones (recalling the atmpsphere of old pictures), are completing the text with harmonious beauty allowing a parallel vision of the story told.